Our friend, Romaine Hart–a wise counsellor–was adamant last night that we were not getting enough PROTEIN! Our tales of how long it’s taking to shake off the virus that has been a companion (on and off) for nearly three weeks was all the proof she needed. So we agreed that a couple of lamb chops for lunch today would be a step in the right direction. Vegetable soups–all very well, but they need backing-up! We are eating meat less frequently now. This is reflected in the meat section of my new book, Healthy Eating for Life (to be published January 8th–my birthday!). I awake this morning intending to visit Lautrec’s Friday market, pick up some lamb chops from the local butcher and see what’s up. It’s a chilly, grey November day and I light the fire. My determination wavers and I start to think, “Maybe chops tomorrow–how about a heartwarming vegetable soup?”. 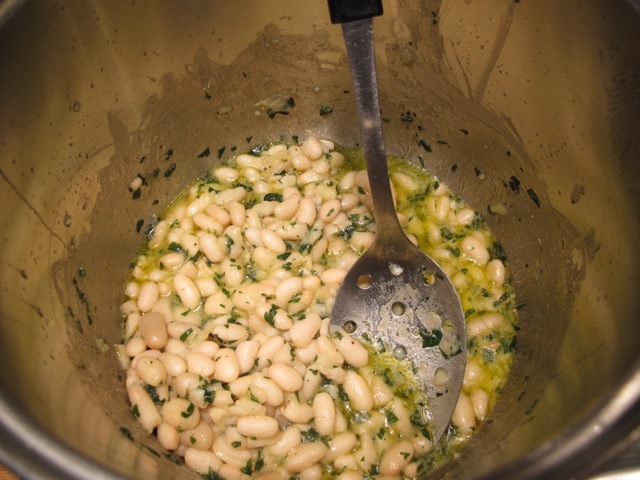 Then I remember this soup from my first book–and rationalize: White beans are a good protein source! I picture it steaming in a bowl with a swirl of the new, green olive oil and thoughts of driving to Lautrec disappear in the mist! Sauté the garlic in the oil gently until it colours. Add the parsley and stir a couple of times. Mix in the beans, salt and pepper. Cover and cook gently for about 5 minutes to warm through. 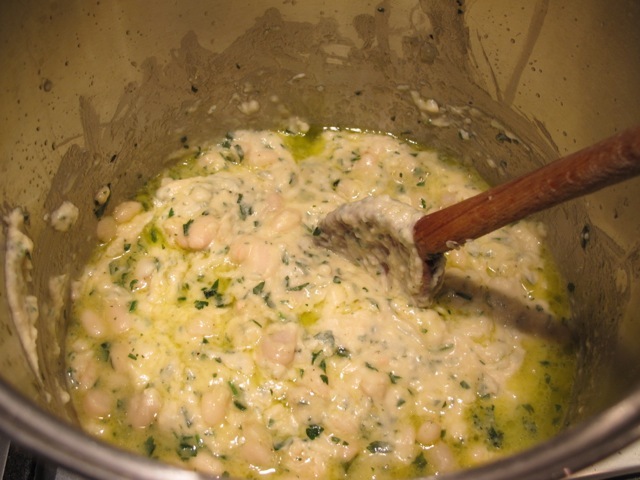 Purée a quarter of the beans in a mixer and return with the stock to the pan. Serve over the toast with a swirl of olive oil in each bowl. Optional: Sprinkle chopped parsley over the top before serving. Looks delicious and perfect for the cold and rainy day we are having here in NYC. Am also trying to cut back on meat. Thanks. It went down smoothly, Mary! Oh, yummy yummy. Hope you are back in the pink soon! Dear Robin, I am vegetarian and this recipe sounds perfect to me! I will try it and let you know. Thank you! Please, Chiara–let me know how it goes. How was the olive harvest this year at Padere Bogglioli? Wish I could find their olive oil here in San Francisco area. Ellen–this soup you are right is comfort soup par excellence! Mmmm looks delicious I’ll add some onions as well as I’m trying to rid myself of a lingering virus also. on November 22, 2013 at 8:01 pm | Reply Dianne P.
Thanks Dianne–went down a treat here too this lunchtime! This looks wonderful! You don’t have to eat meat to be healthy. Dear Robin, thank you once again. This not only looks yummy. Without a doubt it tastes so as well… All’s fine and dandy but when I’m facing a chop on my plate in my mind’s eye I see the actual lamb and not a morsel goes down. You should check with your Doctor and test that your nutrient intake is enough as you have an autoimmune disease, also have your iron levels tested. I have leek and potato soup ready for lunch today, which is bitterly cold and dry. Had bacon, tomato, mushrooms and poached egg for breakfast. Will try this soup next week have enough soups at the moment to feed a regiment! Take care and look after yourself. Thanks Nora–good advice! Bon appetit! 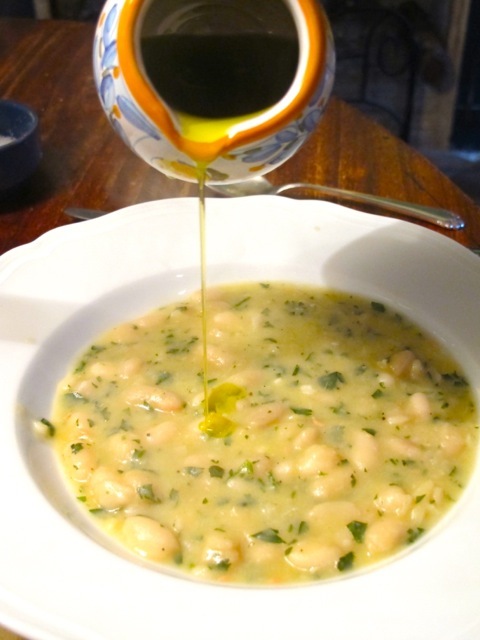 white beans or cannellini true? Got cannellini and broad beans in my local supermarket today will make the soup on Monday, met Santa in his civvies doing his shopping! Didn’t fool one little girl who got so excited she ran up to chat to him, he was charm itself which is reassuring, he drove into town today in Chitty Chitty Bang Bang. Will let you have the verdict on the soup next week. Have your book on my suggestions for presents Christmas list. Those puppeteers deserve the highest awards for their work. We have never seen this now celebrated piece Elaine–glad you enjoyed it and happy to hear the National is touring. Non-vegetarians are always inventing ruses to get others to eat meat. The protein issue is their usual standby. However, we now know that animal protein is one of the main causes of disease in the west, whereas you can eat as much vegetable protein as you like. The answer is that there are a fair number of animal eaters who get sick too! – viruses certainly aren’t exclusive to vegetable eaters!! They did this mercilessly to Steve Jobs; his family and friends eventually forcing him to go back on his moral and health beliefs and eat meat which some believe actually hastened his end. The cancer began many years previously when, as a brilliant student, he experimented with several dangerous chemicals. Some believe that he lasted so long because of his vegetable diet. There was an article in the UK press two weeks ago on Type 2 diabetes. Some medics in the UK are now recommending sufferers to become vegetarian as it dramatically lowers the Pral value (a measure of acidity in the body). I thought about you and wondered if you had read it. Thanks for this, Sheila. I didn’t see the article. Will definitely try this myself and pass the recipe on to my vegetarian sister. Thank you. I hope you are both fully recovered again soon. Such a shame with the worst of the winter ahead of us. I made this soup twice this week. The first time I made it I thought two things: 1. Damn, this was easy. 2. I need more! We had people over who basically agreed. Thanks, Robin! A bit of a late post on this receipe! Hope you are both now recovered from the dreaded lingering lurgy! This is a great dish, and I prepared it last night, with a slight variation in that I used rosemary-infused olive oil – it was very good! 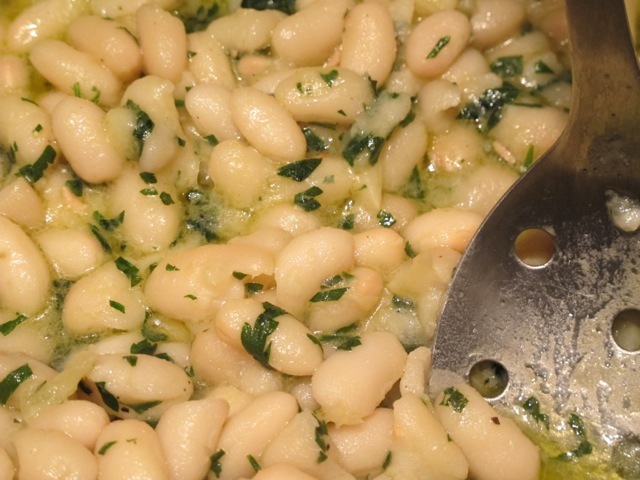 The white bean element reminds me of a dish served at The Hole in the Wall, in Bath, where lamb chops (!) were accompanied by a white/butter bean garllic-infused puree – so next time you fancy the soup, perhaps make the trip to the butcher, and try the puree with it! I have made it again using rosemary-infused oil. Delicious! Greetings from what was a very foggy West End morning which has now bloomed into a wonderfully sunny, crisp day! Perfect. Thanks Kim–we drove through light fog that cleared when we arrived at the airport–fortunately! 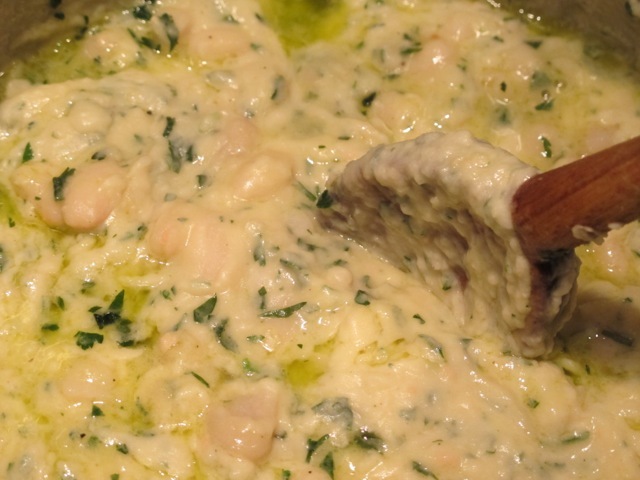 White bean purée is delicious and a good substitute for mash potatoes for diabetics.